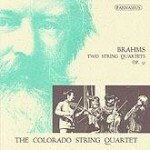 PACD96024 The Colorado String Quartet returns to Parnassus with its second CD for the label. 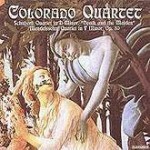 These recordings of Schubert’s famous “Death and the Maiden” Quartet and Mendelssohn’s last String Quartet, Op. 80, were made especially for Parnassus in 1997. the stunning intensity of these performances will impress all listeners, even those who thought the already knew everything the Schubert work has to offer. More details here. 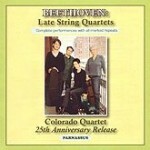 The Colorado String Quartet celebrates its 20th anniversary with newly-recorded performances of Beethoven String Quartets. 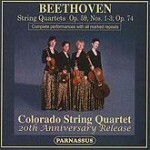 The new recording marks the recorded debut of violist Marka Gustavsson with the Colorado Quartet. 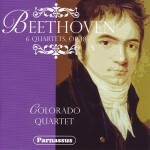 These performance include all repeats marked by Beethoven in his scores, extending their playing time so that the four works are on two well-filled discs. More details here.